After an incredibly busy first few months of the year, the jobs market appears to have levelled off since Easter. Although most of our clients still have a lot of work on, an increasing number have put recruitment on hold until after the local elections. There is a fear that the results in May could impact/delay decisions on projects but if things progress as they hope then there could be a sizeable increase in opportunities, especially within the large-scale housing sector. Developers, however, appear to be optimistic as we are receiving more enquiries seeking in-house Architects/Project Managers so if you are considering a move client side, do get in touch. The salaries and work/life balance of these roles can also be significantly better than within architectural practice and offer an attractive alternative career. The other area which appears to be pretty active at the moment is the transport and infrastructure sector where projects like HS2 are demanding more architectural staff. Candidates with strong Microstation, AECOsim software and relevant sector experience are therefore highly sought after. Due to the scale and duration of some of these projects, positions will often provide excellent long-term job security. With nervousness over what impact Brexit might have, pursuing roles within this sector might be a sensible idea. 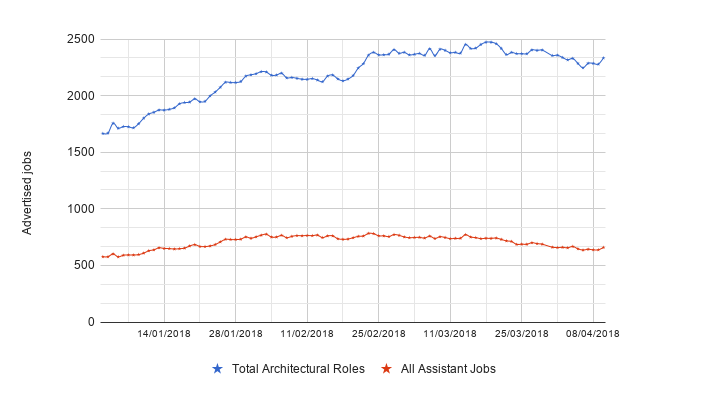 Although the high-end residential sector is a lot slower than previous years, there are still practices keen to meet Architects (with at least 5 years post part 3) who have excellent client facing skills and an ability to bring in new projects. A final note of interest was highlighted by the latest RIBA Future Trends Survey which showed the Regions are generally feeling far more positive about future workloads than central London. This is being reflected in the rising number of opportunities in the Midlands, North West and around the outskirts of London. With the slowdown of jobs in London, however, for firms who are still seeking new staff, we have recently received the CVs of some particularly strong all round Architects looking to progress their careers. If you would like to discuss any of the above further, do give us a call on +44 (0)20 8004 0369.